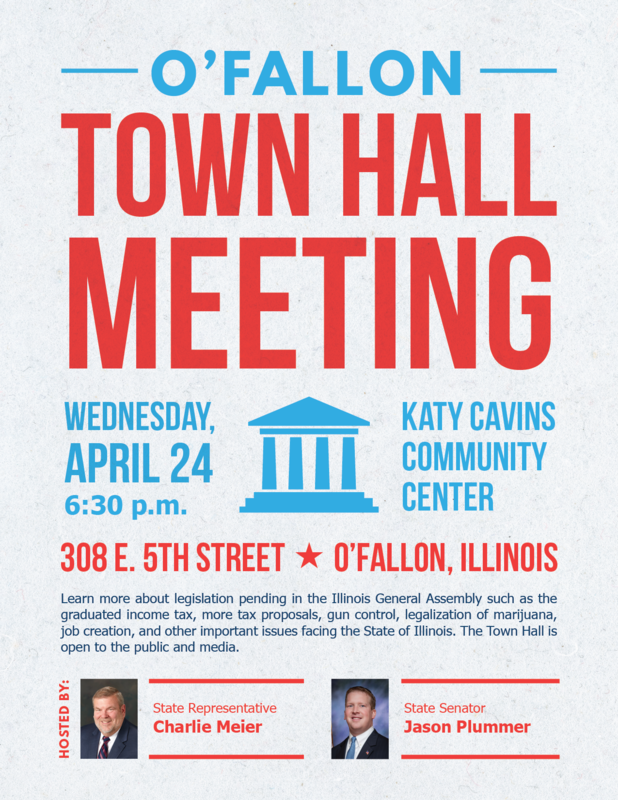 State Representative Charlie Meier (R-Okawville) and State Senator Jason Plummer (R-Edwardsville) are hosting a Town Hall Meeting on Wednesday, April 24th, 6:30 p.m. at the Katy Cavins Community Center located at 308 E. 5th Street in O’Fallon, Illinois. Participants at the O’Fallon Town Hall Meeting will learn more about legislation pending in the Illinois General Assembly such as the graduated income tax, additional tax proposals, gun control, legalization of marijuana, job creation, and other important issues facing the State of Illinois. The Town Hall is free and open to the public and media. For more information about the O’Fallon Town Hall Meeting, contact either Representative Meier’s office at 618-651-0405 or Senator Plummer’s office at 618-283-3000.